360 MembershipTM is an affordable, new generation, cloud based, hosted software solution designed for Australian Professional Bodies, Associations, Unions and Industry Organisations to manage all aspects of providing the membership value and engagement. It is suitable for the small club with few hundred members to large member association with many thousand members. In simple terms, using the term 'Cloud' to describe product means that the software and data reside on a server which is off site located and maintained by a third party (us), thus sparing the client the worry and costs of running the server. Designed to reduce administration cost, enhance workflow efficiency and, above all, provide a compelling, informative and enjoyable member experience, 360 MembershipTM will help your organisation to grow and prosper. We realise that no two organisations are the same and consequently may have unique requirements. CocoNET Technology, as an Australian software developer, is happy to discuss your specific requirement and added features. 360 MembershipTM was designed, developed and is supported by CocoNET Technology. Conferences, training sessions and other (member) events may be managed via closely linked third party products. Additionally, for the larger organisation, 360 MembershipTM will integrate to sophisticated large conference management services. Using the latest technology, 360 MembershipTM allows your members to manage their own information, access the latest Newsletters and receive your solicitations and notices, across the ‘Net, via their own portal. Unlike traditional software products, members and administrators can access their own, secure areas, from anywhere there is an internet connection, from any smart device. The application and data are stored on secured Data Centre, located at a secure and disaster protected facility in Australia. Installation and training is provided for a set fee, which includes form creation and simple data migration. As a cloud based service, the physical location of your organisation is irrelevant. Updates and enhancements are provided regularly. 360 MembershipTM can be integrated to most common accounting packages, notably to MYOB. 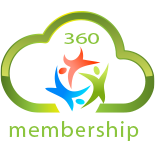 We can link 360 MembershipTM to your existing website if required, simply by adding a new tab marked Membership or similar. We can also import your style sheet across the members area to give a common look and feel, thus strengthening your brand. Alternatively we can create a whole new site for you with 360 MembershipTM functionality seamlessly integrated. This is a standard feature however the customer will need to pay the cost of SMS transmission to a 3rd party provider. * All the above additional features carry a cost, either payable to CocoNET or a 3rd party supplier.